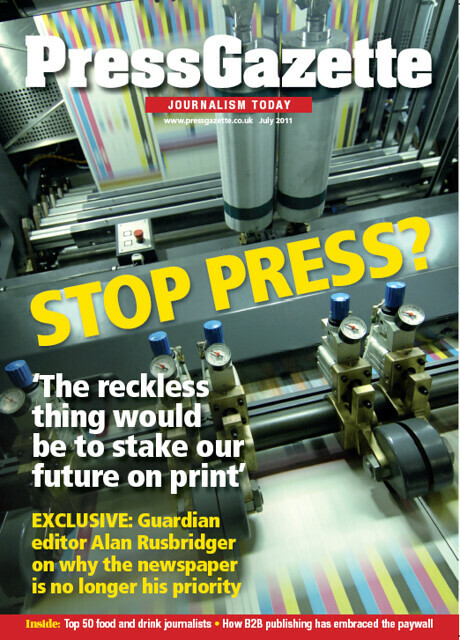 Guardian editor Alan Rusbridger writes exclusively about why he is taking resources away from the print editions of The Guardian and the Observer to invest in digital. We name the top 50 food and drink journalists as voted for by journalists working in the sector and by the general public. Investigation into how B2B publishers learned to love the paywall, featuring: Phil Clarke from UBM, Tim Potter from Centaur, John Barnes from Incisive, Conor Dignam from Emap and Charles Reed from William Reed. BBC producer Joe Plomin on the inside story of Panorama’s shocking investigation into the abuse of vulnerable adults a Bristol care home. Jon Slattery investigates how the Coalition Government’s crackdown on council-run newspapers has thrown the local press a much-needed lifeline. For details about how to subscribe to Press Gazette magazine – and lots more reasons why doing so is a good idea – click on this link.